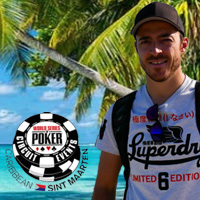 Online poker tournament players share their experiences at live poker tournament events in Europe and the Caribbean. Note: The videos we had posted here are no longer available. Day 2 began at the European Poker Championship in Velden. 11 pm Day 2, 46 players remain in the game. Unfortunately we lost all remaining Intertops players today. Sven went out about 9 pm, then Csaba Molnar lost with 88 against AK and AK and finally Péter Gál went out around 20 places before the money and was thereby the best qualifier from Intertops. Remaining are big names Steve O’Dwyer, Dominik Nitsche, Steffen Sontheimer and last year’s winner Matthias Habernig. Rather get an email you when we publish new videos? COMING UP! Starting Friday, March 29th, we follow five online players as they travel to the Caribbean to compete in the $250,000 GTD WSOPC Caribbean, St Maarten. European Poker ChampionshipsVelden, Austria -- July 2018This isn't the first time that Hungarian Peter Gall has qualified for a big-money tournament by winning an online satellite at Intertops Poker. This time he came closer than ever! Click here to watch the videos. Tim and Chris are back with three more online poker players including Elena Stover who'd just placed second at the Borgata Million in Antlantic City. This time our poker adventure took us back to the Caribbean. Click here to view video reports. Three online poker players won their way Austria to compete in the Main Event at CAPT Seefeld in February. The two American players learned a lot about playing with Europeans -- and developed a taste for schnitzel! Living the Dream followed five online poker players that competed in the CPT Punta Cana Main Event last fall. Two are poker pros and three are recreational players but they all won their way to the Caribbean in online satellite tournaments. from the Hard Rock Casino Punta Cana. At the Punta Cana Poker Classic in October, we met some professional players like Faraz Jaka, the Homeless Millionaire, but mostly we talked to online players that had won their way to the Caribbean and were living the dream at their first big live tournament. Click here to view all videos from the Punta Cana Poker Classic. Travel theme. Theme images by A330Pilot. Powered by Blogger.